Adventures with ClassPass, Part III | Keep It Up, David! I’ve been working out all over town thanks to ClassPass, which gives me access to fitness facilities all over the place without needing a membership to any of them. You can learn more about ClassPass in this post (or at their website). Wanna see what I’ve been up to? 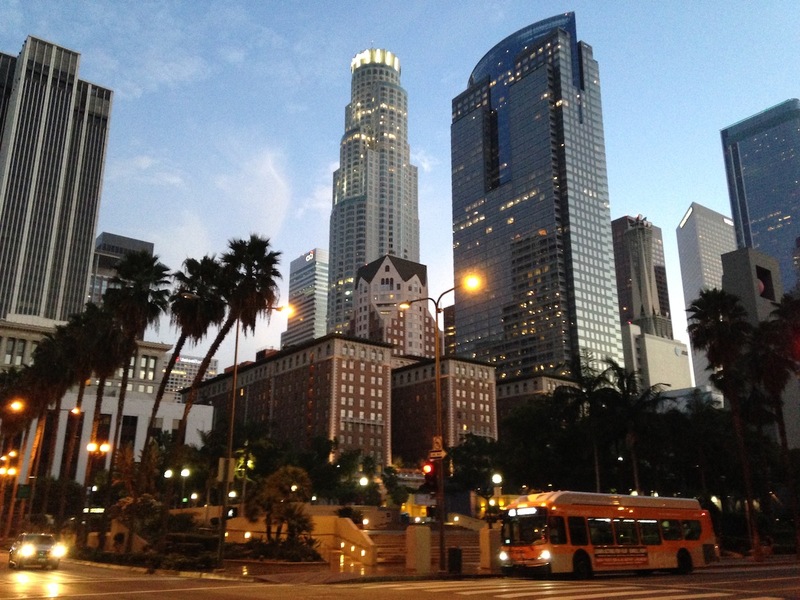 Urban Boot Camp, UEvolution (downtown Los Angeles). 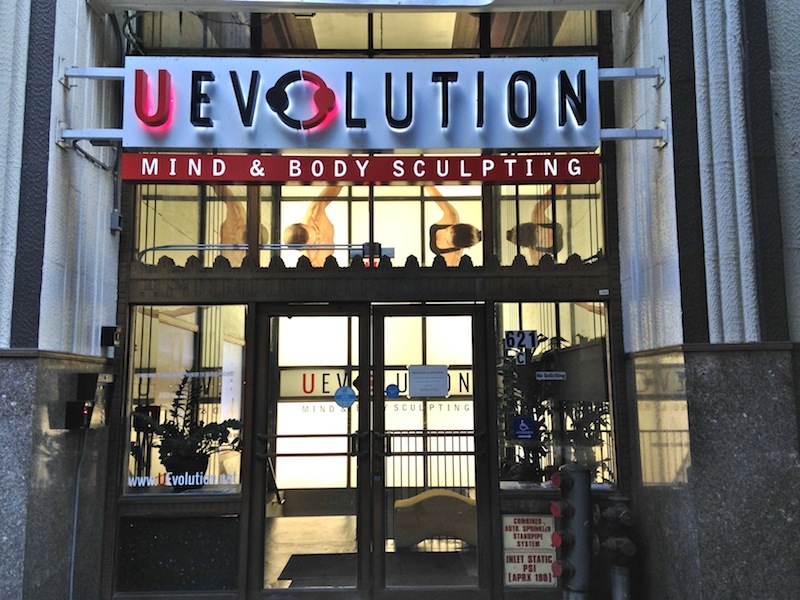 UEvolution is a beautiful gym in downtown LA. Well, they don’t say “gym”, they say “mind & body sculpting.” It’s in the basement of a building, and once you get down there, you don’t want to leave. They’ve created a fancy, spa-like environment: free bottled water (cold or room temperature), tiny bottles of shampoo and conditioner lined up at the front desk, top-of-the-line equipment and machines, the nicest locker room I’ve seen. The class was at 6am and pretty far – I woke up at 4:30am so I had plenty of time to make it to the train, although I probably could’ve slept another 20-30 minutes. I arrived downtown before the gym even opened, so I had a few minutes to wander. I’d never been downtown so early, and it was eerily quiet and surprisingly beautiful. I thought with a name like “Urban Boot Camp,” this somehow might be a different class experience than the other boot camps I’ve taken. Not really. It was a tough class – lots of walking lunges, burpees, planks, mountain climbers, and even stairs (racing up and down the few flights from the basement to the lobby), all interspersed with running on the treadmill – but nothing out of the ordinary. I was also the only person in the class, which at the beginning I thought would be awesome, but I ended up wishing some other folks were there. I like group fitness classes because I like being motivated by the people around me. It was a good workout. I’m glad I went. But I can get very similar workouts at places much closer to me, so I probably won’t head back to UEvolution. Actually, since I took that class a few weeks ago, it appears as though they’ve stopped offering it. No mention of Urban Boot Camp on their website, and no 6am classes of any kind! Perhaps mine wasn’t the only class that wasn’t well attended? Stadium Fitness (Pasadena). My second visit to the Rose Bowl for a boot camp class. I devoted a whole post to this class a few weeks ago (read about it here), because I loved it. This time around, it was still a good class, but there was one big difference: we weren’t allowed in the stadium. The class was the morning after Beyonce and Jay-Z’s concert, and crews were busy dismantling the stage and cleaning up. 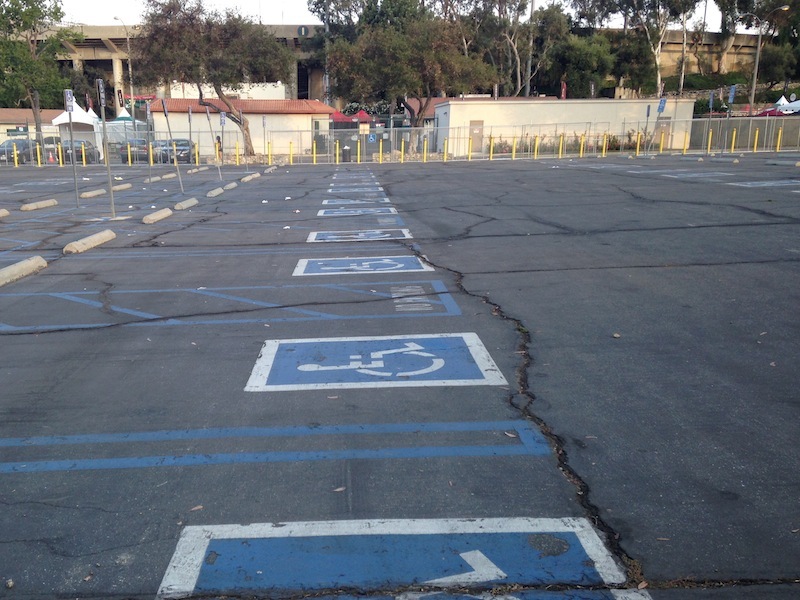 So our class was held adjacent to the Rose Bowl, in the largest all-handicapped parking lot I’ve ever seen. To their credit, the folks at Stadium Fitness emailed me about the lack of access to the stadium that day, but I didn’t see it until after class was over. Not being in the stadium was a bummer, but the class still featured every major element (except the stairs), so I left exhausted. Lots of sprinting, lots of stuff with a free weight, and something I haven’t done since elementary school: skipping, which was part of the warm-up to loosen up our muscles. Barry’s Bootcamp (Sherman Oaks). This was my third class at Barry’s Bootcamp, and my favorite one yet. It seems like all the classes at Barry’s are very similar – you alternate between treadmills and floor work, and it’s brutally difficult. So class experience differ because of the instructor. The instructors of my previous classes weren’t bad by any means, but this instructor, Erik Steffens, was my favorite so far. Erik had a lot to say, and he really knew how to motivate and encourage. He kept returning to a common theme: that success in this class (and elsewhere) was as much mental as anything else. I know I’m quick to let a crappy attitude ruin a workout (this post is a perfect example), so those reminders resonated. The class was hard – and I wasn’t feeling 100% to begin with, which made it harder – but I powered through, and Erik was a big reason why. Rock It Box, Rock It Fit (Pasadena). This was my second kickboxing class at Rock It Fit, and I loved it just as much as I did the first time. I’d forgotten a lot of what I’d learned before (in regards to form and technique), but most of it came back, and Jeff, the instructor, was always around to correct form and teach new moves. Plus, the class started with a jump rope warm-up, and I’m better at jump rope that I would’ve guessed! I can’t do any special moves, but I can keep that rope going, which is pretty good, since I hadn’t jumped rope before my first Rock It Box class since my P.E. class in high school, when I was terrible. I was terrible at everything during P.E., except swimming, but now, I think I’d do pretty well! This entry was posted on Friday, August 15th, 2014 at 1:47 am and is filed under Uncategorized. You can follow any responses to this entry through the RSS 2.0 feed. You can leave a response, or trackback from your own site.